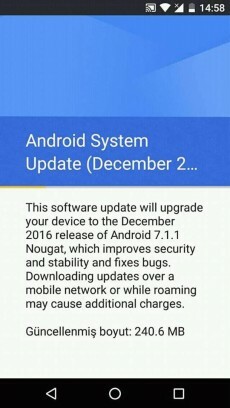 While an Australian carrier pegged the release date of the final version of Android 7.1.1 Nougat for devices supported by Google as December 6, it looks like the rollout is already under way. That is, at least for one phone, and it's not a Nexus, nor a Pixel. It's the General Mobile 4G, an Android One device launched in May of last year. This handset has pretty much been confined to the Turkish market, and it's there where the update to Android 7.1.1 Nougat is now becoming available. If you have a General Mobile 4G, expect to soon see a screen just like the one shown in the image to the left. As you can see, going from Android 7.0 to Android 7.1.1 requires a 240MB download. The new release also packs the December security patches, which haven't been detailed by Google yet. But since this is out now, we assume the official announcement for both the Android 7.1.1 rollout and the December security fixes is imminent. 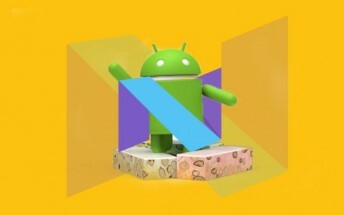 And that means that the other devices that currently get their software updates straight from Google should receive the new Android version in the coming days too. We're talking about the Pixel and Pixel XL (which are on Android 7.1, not 7.1.1), but also the older Nexus 6P, Nexus 5X, Pixel C, Nexus 9, Nexus Player, and maybe even the Nexus 6. The last developer preview of Android 7.1.1 went out in November, at which point Google did say the final version would be coming this month. So here we are. Start tapping that Check for Updates button.